Volcanoes on Mars like Elysium Mons, whose volcanic region is pictured here, grew much slower than their counterparts on Earth, a new study has found. Volcanoes on Mars are more than 1,000 times as old as their counterparts on Earth, new research suggests. The new study, which came out on Oct. 3 in the journal Nature Communications, looked at Martian meteorites, which allowed scientists to finally ascertain the ages of different lava flows on the Red Planet. The greater age of Mars' volcanoes stems from structural differences between them and those on Earth. Many of Earth's volcanoes form as tectonic plates overtake one another. The rock from the lower plate melts and fuels a chain of volcanoes, like the Cascade Rangeof the Pacific Northwest. Volcanoes can also form over particularly hot plumes in the semi-molten mantle. These hotspots give rise to volcanos like Mauna Kea in Hawaii. In fact, the Hawaiian Islands formed as the Pacific plate drifted northwest over the stationary hotspot located there. Scientists have resorted to counting nearby impact craters to estimate the age of various features on the Martian surface. The more craters a surface has, the longer it has been exposed to impacts, said Benjamin Cohen, a planetary scientist at the University of Glasgow in the United Kingdom, who led the new study of Mars' volcanoes. "That's really good for getting relative ages," Cohen told Space.com. "The challenge is calibrating and putting a number to it. Saying that this many craters equals this age. This Mars meteorite is a piece of a volcano that erupted over 1.3 billion years ago. Such meteorites, known as nakhlites, have revealed that volcanoes on Mars grew much slower than ones on Earth. Cohen said these meteorites meant he could finally establish a timeline for the Martian volcanoes. His team analyzed six of the meteorites, looking for several varieties, or isotopes, of the common, nonreactive gas argon. One isotope forms from radioactive decay once the rock cools from the eruption. Other argon isotopes are produced when high-energy cosmic rays bombard atomic nuclei, as could happen in the meteorites on their journey to Earth. By comparing the ratios of isotopes in the rocks to those in the Martian atmosphere, the researchers were able to calculate when the meteorites formed, Cohen said. The team pieced together the total age of the rocks by combining their time in space with the time they spent on the Martian surface. The team then looked for craters that matched these ages and are large enough to have ejected debris out of Mars' orbit. They identified a particularly promising crater in the Elysium lava plains, northwest of the Elysium Mons shield volcano. Cohen's team discovered that the rock fragments in the meteorites formed at different times. Instead of hailing from a single lava-flow layer, the nakhlites span some 93 million years of volcanic eruptions, the researchers said. In contrast, Mauna Kea, on the Big Island in Hawaii, is only about 1 million years old. 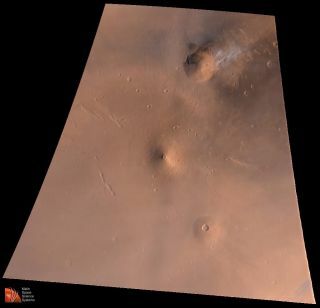 The group estimated that the entire Martian volcano from which these meteorites came is at least 1.3 billion years old. Data suggest that this volcano must have grown at only 1.3 to 2.3 feet (0.4 to 0.7 meters) per million years, the study said. Extrapolating this rate to the full thickness of the nearby volcano Elysium Mons yields an age older than that of the solar system. This means that Mars must have been far more volcanically active earlier in its history, the researchers said. Crater counting and planetary heat-flow models also support this conclusion, the study found. High-resolution satellite photographs seem to corroborate these conclusions; the images reveal extensive, thin lava flows on the Martian surface, the study said. Cohen said he plans to continue studying Martian volcanism. "No one has seen an eruption" on Mars, he said, "but we haven't been looking for very long." Cohen added that as far as he knows, there has not been an eruption on Mars within the last 10,000 years, the threshold for calling a volcano active on Earth. However, this is probably too short a time frame to be meaningful for the slow-growing Martian volcanoes, he said. Most of all, Cohen said, "I would really like to know when the most recent lava erupted on Mars."